As I gear up for my MDRS mission, one of my priorities is ensuring that I'm physically fit to handle the rigors of living on analog Mars. 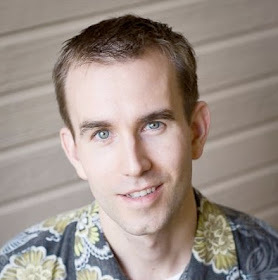 The XTERRA Trail Running World Championship Half Marathon was the ideal challenge for me. I competed in the 2nd annual race this past weekend at Kualoa Ranch on Oʻahu's windward coast. Billed the "most scenic half marathon trail race on the planet," the course snakes through dense rainforest and broad valleys on secluded singletrack trails and dirt roads along dramatic knife-edged mountain ridges. According to the XTERRA news release, more than 1,000 runners from 35 states and 9 countries participated in the day’s 21k, 10k, and 5k races, which raised money to support the Juvenile Diabetes Research Foundation of Hawaii. I've run hilly races, half marathons, and trail races in the past, but I've never done all three at once. 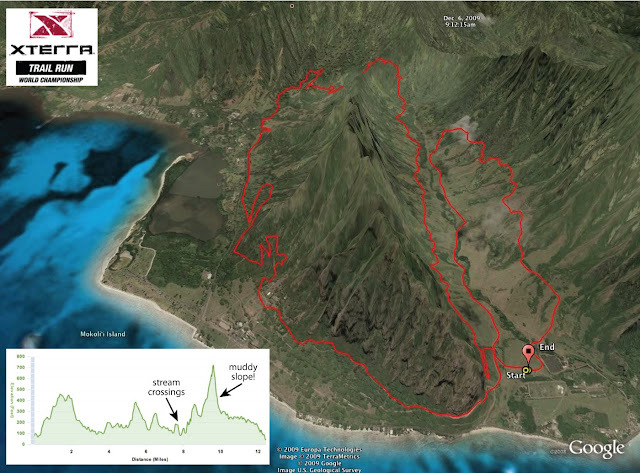 The XTERRA course advertised 2,900 feet of elevation change (although my Garmin Forerunner GPS said 1,900 feet) weaving up and down the verdant cliffs of the Kaʻaʻawa and Hakipuʻu Valleys. We crossed several streams and had to negotiate some slippery muddy slopes. It was a hot, sunny day at Kualoa Ranch, whose beautiful landscapes have attracted a number of movies like Jurassic Park and TV shows like LOST. The race course supposedly passed eight different movie locations, but I didn't notice (I guess I was too focused on the trail.). This is the same place where a film crew documented my ATV training prior to the 2009 FMARS mission. I didn't learn about the event early enough to undergo a training program specifically for a half marathon, so I tested myself by running two 5k races and two trail runs just to make sure I was in shape. I also did the two most difficult hill workouts on my NordicTrack X3 Incline Trainer. My confidence got a boost when I won my division in one of the 5k races, so even though my training level wasn't optimized for the half marathon distance, I opted to run it anyway. After all, Mars explorers won't have the option to cut corners, so why should I. The folks at XTERRA have already put together a great highlight video from the event, which you can watch below. Last year's video is also well worth viewing. There are several photos posted on the XTERRA website too. I really appreciated the family-friendly race expo. My wife and son came to the event with me and hung out at the expo while I ran. My son loved climbing and swinging on the ropes they had set up and taking part in the kids games. At barely 2 years old, he was the youngest of about 50 kids who participated in the Kids Sprint Run. I made a highlight video of my own about his first race below. Unlike FMARS, MDRS does not have a treadmill and exercise bike inside the Hab, so I'll miss being able to get quality cardiovascular exercise while I'm on "Mars." I guess I'll have to meet "Commander Durocher's Challenge" and run a 5k wearing a spacesuit. I originally had planned to run the Haughton Crater Run on Devon Island in full spacesuit simulation garb but opted not to in the interest of safety. Brian, I say we go for the challenge! Sounds like the run was a blast (and thanks for linking to the Garmin track of it), and I hope I'm not the only one who thought of a pack of Gallimimus when you mentioned Jurassic Park.